This entry was posted in STS Gossip, Teaching, The Profession, Uncategorized by Nicholas. Bookmark the permalink. HA! I had never heard flyover country (I had to look it up! ), but I do know hinterlands. The point is dead-on; crumbling infrastructure, and doing something with/by it, seems like a reasonable and not-at-all apocalyptic view! When you say “diagnostic manual,” what do you mean? it was a bit tongue in cheek (I’ve been fighting against the pseudoscience of the DSM for years) but was suggesting that we think about how to frame (in a loose familial-resemblance kind of way) styles of (I’m also dead-set against diagnosing publics with pathologies as if they were persons/actors) living/planning/politicking that feed into or work against the disintegrations of our democratic/common infrastructures. I could live with that; would the idea be to make theories that are not so much “truer” than others (in the scientific sense) but to build theory (or component theory-parts) that are “actionable”? 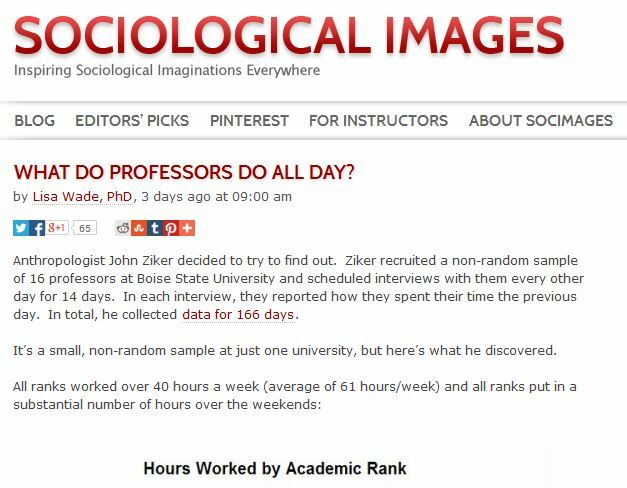 What are professors up to all day?